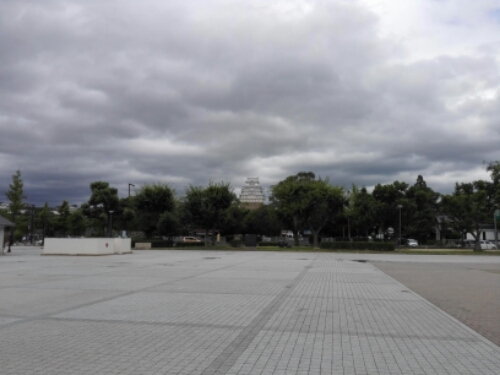 The trip to Himeji wasn’t planned, in fact I had never heard of Himeji until the night before. 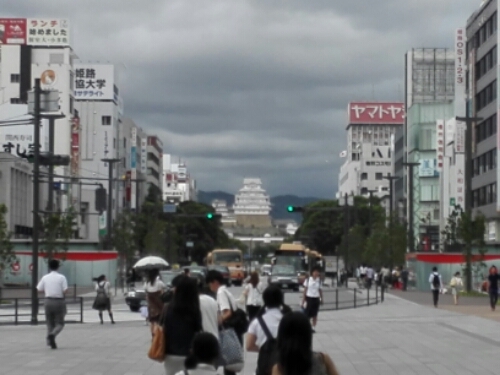 There are so many places to see in Japan, I can’t know of them all, and Himeji had missed my attention. When I heard the castle was regarded as one of the finest surviving castles in Japan I knew I had to go. I took a train from Okayama to Himeji, about half an hour on the shinkansen. As I got out of the station I instantly saw the castle, no need for a map. There has been fortifications on Himeyama hill ever since the year 1333, when Akamatsu Norimura constructed a fort there. Thirteen years later, his son had the fort demolished and built instead Himeyama Castle on the site. Himeyama Castle stood for over two hundred years, until 1545 when Kuroda Shigetaka, lord of the Kodera clan, had the castle rebuilt into Himeji Castle. This project was finished in 1561. The castle was again remodeled some decades later, moats were added and the temple complex started to look like it does today. 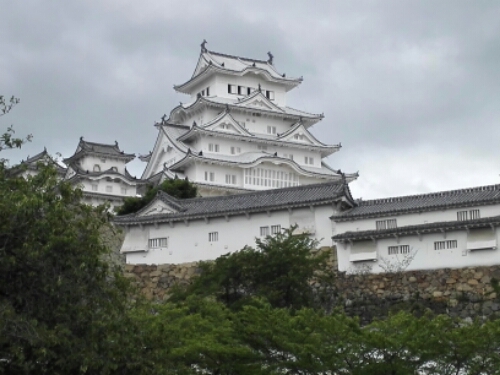 The Meiji Restoration destroyed many castles in Japan, but somehow Himeji Castle survived. It was put up for auction in 1871, and purchased by a local resident wanting to get rid of the castle and develop the land. The plans came to nothing as the cost of demolishing the castle was too high. The castle is very popular, and I have read that there often is a long wait to get in. When I visited there was no line outside, but when I entered I soon found myself walking through the castle in one. 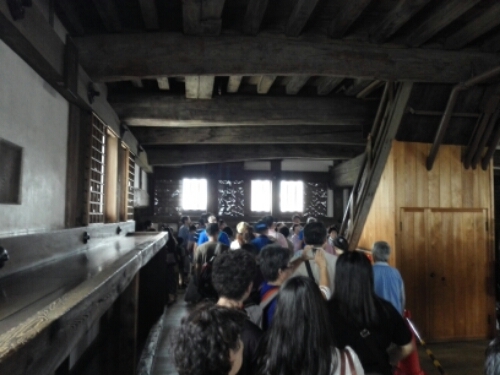 When visiting the castle you have to follow a specific route through the castle, no wandering around by yourself, and in some places the passage can be quite narrow and form a bottle-neck. The castle itself is quite impressive, the main keep is huge and full of defensive measures, like places to hide for defenders. I however found the outside more impressive than the inside. On the outside it was beautiful, sitting on top of a hill, so easy to see, the white color catching the light. Inside it was dark, it was crowded, you were forced to walk in a line. I was glad I didn’t come here on one of the really busy days. 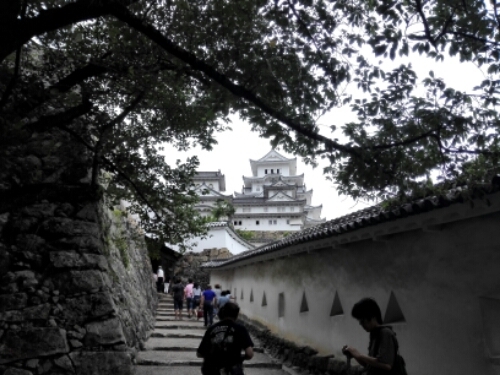 During World War Two Himeji was heavily bombed, but somehow the castle was spared. A lonely fire bomb hit the castle but luckily failed to explode. 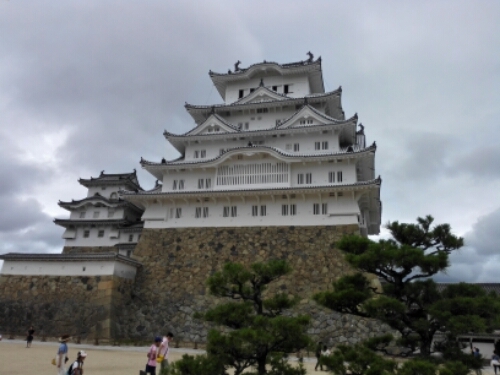 Unlike so many Japanese castles, Himeji Castle had survived both the Meiji Reformation and World War Two. The castle was put on the UNESCO World Cultural and Heritage list in 1993 and was virtually undamaged during the Great Hanshin Earthquake in 1995. Since late 2009 the castle has been under renovation, it only opened early in 2015 again. It had now been restored close to its former glory. 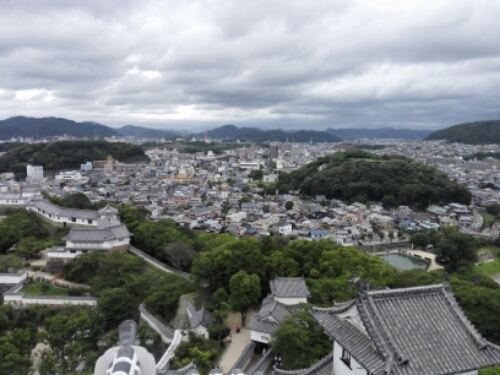 Himeji Castle is worth a visit. The view as you approach is stunning, the castle is so beautiful. 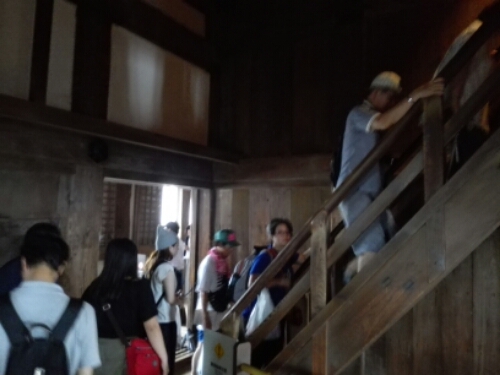 Seeing the inside can be quite crowded, but it was cool to see a real Japanese Castle and how it was built. The day before I had been to Okayama Caste, a replica built in recent times. The elevator inside ruined the experience a bit. 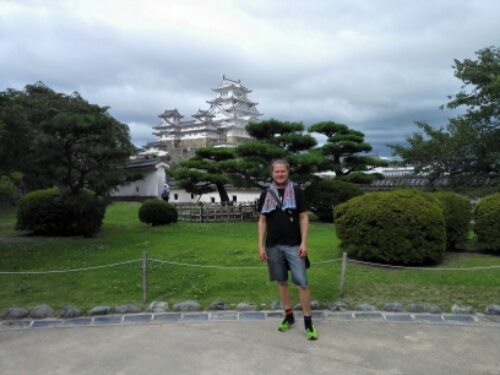 Himeji Castle felt authentic and real. Old wooden beams, bad light in some place. The old smell. One of the better castles I have visited in Japan.